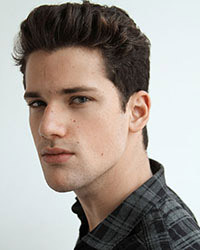 Arthur Sales was born in Recife, Pernambuco, Brazil, on July 22, 1991, is a Brazilian male model. He began his modeling career at the age of 10, modeling locally in his town Recife. He was discovered by a model agent Elizabeth Pontes. Arthur began his international modeling career in 2009. He appeared alongside Shakira in Vanity Fair. He practicing the art of Brazilian Jiu Jitsu. Made in Brazil Magazine, Various Editorials, Ellus S/S 13 Brazil, Arthur Sales for Pull & Bear Lookbook, Fiasco January 2012 Cover, Armani Jeans Lookbook S/S 2012, GQ China, Positive, Client, GQ Brasil, Hercules, GQ Taiwan, GQ Germany, Hercules Magazine, Visual Tales, Electric Youth, Guapo, Vanity Teen, Sport & Style, Made in Brazil, L'Officiel Hommes, Vanity Fair. Dopping Jeans Summer 2015, Lexington Spring 2013 Campaign, Dsquared2, MaxMara, Lincs by David Chu, American Eagle, Hugo Boss Boss Orange F/W 2016 Campaign. Walked runway for Dsquared2, Adam Kimmel, Iceberg, Parke & Ronen and Ellus. My mom when I was a kid put my name in one beauty contest and I won it. About being a model, I don’t find me ugly, but I never thought I could work in this. I really appreciate real and true friends sometimes it is difficult to make friend easily.